Soup season is upon us! 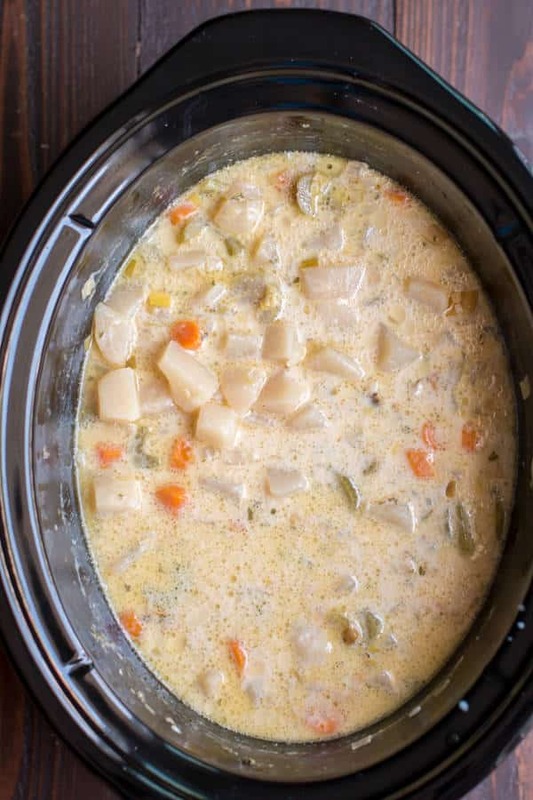 This buttery and creamy Slow Cooker Homemade Potato Soup will be your new go to soup recipe. Finally a new Vintage Recipe of the Month, I haven’t posted one since May! 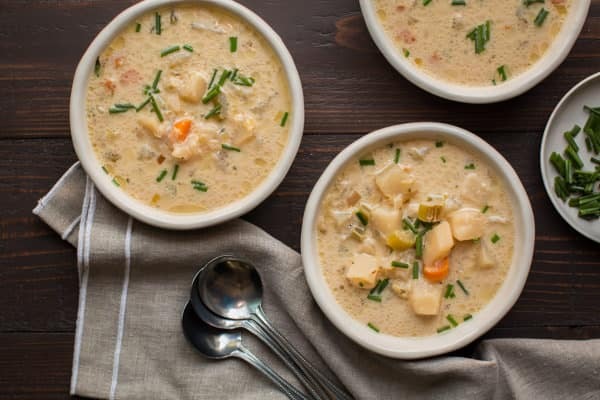 This Slow Cooker Homemade Potato Soup is a keeper. It tastes just like grandma would make, lots of veggies but also creamy and buttery. 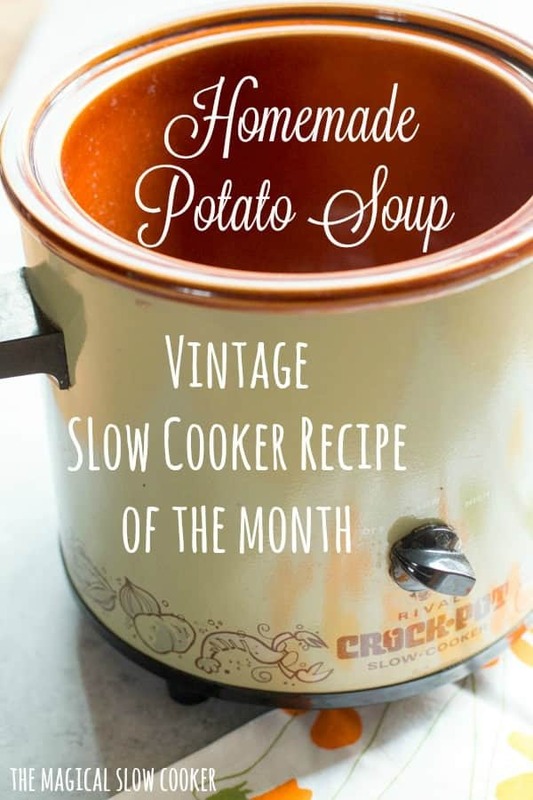 I found this recipe for Slow Cooker Homemade Potato Soup in this vintage recipe book below. My husbands co-worker Jim gave this to me a few weeks ago and I knew I had to put a recipe on the blog from it. This little book must have came with a slow cooker back in the 70’s. There is some fun recipes in this book such as Pork Abracadabra, Hot Dog Perfection and even a recipe on how to cook squirrel. When I looked over this potato soup recipe, I thought the ingredients were perfectly thought through, like a delicious meal a grandma would make. I stuck with the original recipe for everything but the salt. The recipe in the book called for 1 tablespoon of salt, I’ve never put that much in any recipe, especially one with 4 chicken bouillon cubes. Instead I added a 1/2 teaspoon of salt after the soup was done cooking and thought that was plenty. My favorite ingredient in this recipe is the butter. 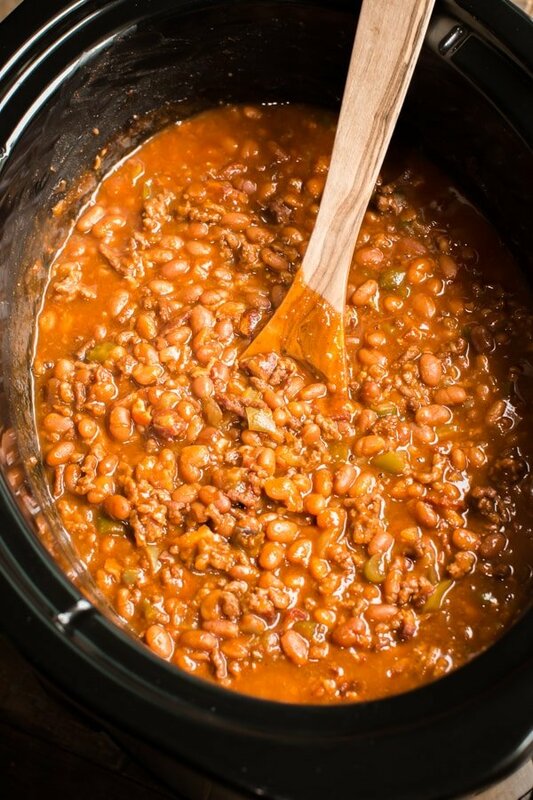 What a great idea to add flavor to a soup, especially a crock pot recipe that doesn’t have any browning of ingredients before hand in fat. I was so happy with the results of this soup. This was the first time I’ve added evaporated milk in a soup, it tasted just fine! The evaporated milk made the soup very creamy, which I didn’t expect. The recipe called for topping the soup with chives at the end, that added extra flavor and freshness to the final product. See my YouTube video of this recipe below. You can follow me on YouTube, here. 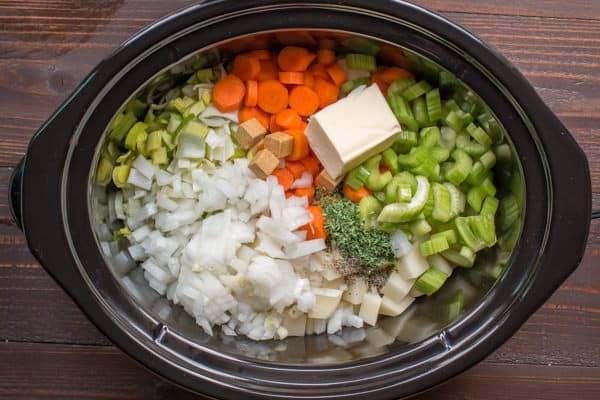 Please give this soup recipe a try, you will not be disappointed. I actually have plans to put a pot of this soup on before heading to the coast to go crabbing. I think adding cooked crab at the end of the cooking time in the soup will be amazing. Have a great week! Add everything but the salt and chives to the slow cooker and stir. Cover and cook on LOW for 9 hours, without opening the lid during the cooking time. What can I substitute for leeks? A little more onion? They have an onion flavor. 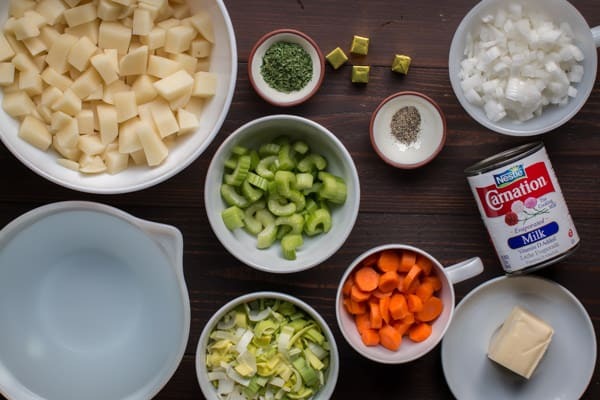 I have a question on the potato soup: it calls for 4 chicken bouillon cubes, which I do not use. I use chicken base, which calls for 1 tsp per cup of water. With those measurements, what would be the equivalent amount of the chicken base to the cubes, for 5 cups water? In other words, does one cube equal one cup of bouillon, or does one cube equal a different amount? Thanks! Hi Pat! You could do the 5 tsp. I think it would be fine. Then taste at the end to see if it needs salt. What would I do to make a thicker potato soup….this one looks pretty thin. This is meant to be a thin soup. Add cream cheese in a blender with part of the soup at the end. You could add instant potato flakes to thicken or you could do what I learned from my GMA and add rivlets. They’re like a dumpling made with floor and egg and dropped in in lil pieces. I guess it’s because I’m old…my mom used canned milk to make tomato soup and potato soup, so when I want my soups to be creamy, I’ve always used canned milk…it’s easy to keep on hand and it does impart a nice flavor…it’s nice to a recipe with that as one of the ingredients. I’d actually be interested in seeing that squirrel recipe you mentioned was in the book! 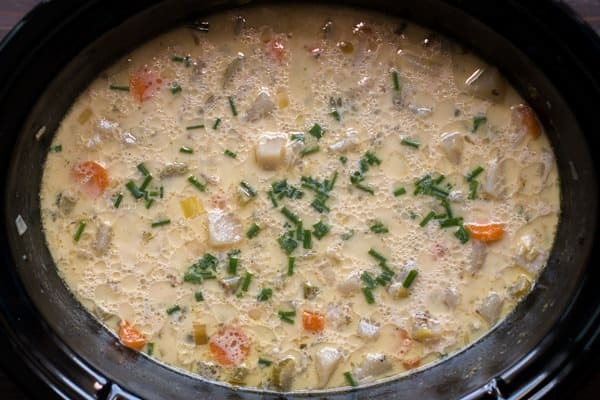 For a cheesy potato soup, what type of cheese and how much would you recommend, and when would you add it? How long would you let the cheese cook? Or would you just add at the very end and then serve? Cannot wait to try this! I use extra sharp white cheddar in my potato soup!!! Sounds amazing! I’ve been using white cheddar in everything lately! I would think the cheese would also thickening it as well. Correct? Would you believe? 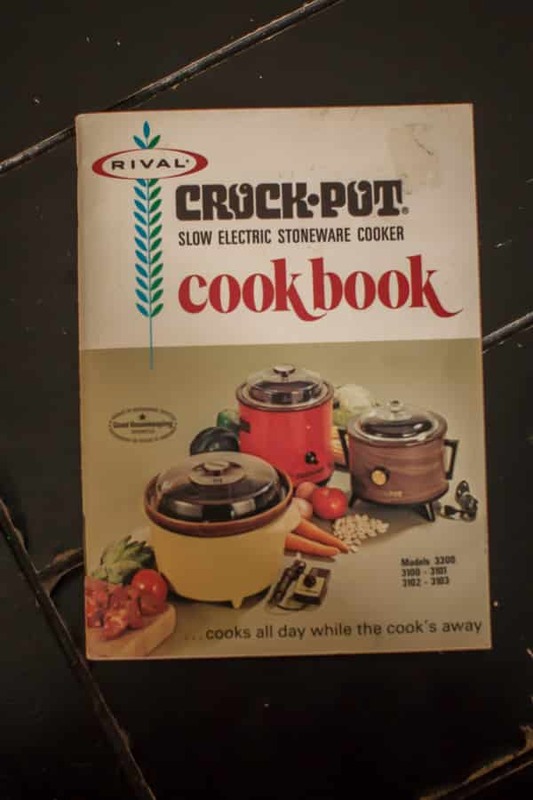 We still have a crockpot as pictured on the cookbook. It still works fine. No longer have the cookbook though. Would this recipe be fine if I leave it on low for 12-13 hours?. I work 12 hour days and would love to have this when I get off work. I would like to make this for supper. How long would you cook on high instead of low for 9 hours? If I want to make this vegetarian what can I use in place of chicken boullion cubes? I don’t typically cook meatless so not sure. Thanks! Bwahahaha! I’m vintage! I got that crock pot as a wedding shower gift in…1979. I’m still using it! Hi Sarah. I made this potato soup, and it was delicious. I have one question about it though. I cooked it on low for 9 hrs. and the soup looks like maybe the milk kinda curdled. Is this normal? Mine didn’t seem curdled, did you use the canned evaporated milk? I’m trying to figure out what could have happened. I just made this again last night, and it turned out perfect. I’m guessing that maybe my milk was old when I made it the first time. Thank you so much for this recipe, it’s a big hit at my house. Yes, used can of evaporated milk. Actually, if I could find my book like the one you pictured, I’d be a happy camper. But if I remember correctly, I think the ev. milk is supposed to be added at the last 30 mins of cooking and to help thicken it up, you can mash up some of the potatoes in the cooker. I fixed this alot the first few yrs we were married as I received 2 of these crock pots as wedding gifts in ’79. Still have one. Thanks for posting this!! Great tips CeCe. I plan to make this again soon and will try your tips. Thanks. I think you are right. I remember adding the milk after the soup was cooked. Still using my avocado green crock pot from the ’70s. I love your tips Shelly! Thank you for letting us know how it worked for you. THANK YOU SO MUCH FOR POSTING THIS RECIPE. WHEN WE GOT MARRIED IN THE EARLY ’70S, I WAS GIVEN AN AVOCADO GREEN CROCK POT THAT STILL WORKS TODAY! I MADE THE POTATO SOUP RECIPE FROM THIS LITTLE RECIPE BOOK OFTEN AND MY FAMILY LOVED IT. I LOST THE RECIPE AND WAS TRYING TO REMEMBER THE INGREDIENTS WHEN I FOUND YOUR BLOG! THANK YOU, THANK YOU, THANK YOU!!! That made my day Mary! So glad you found this recipe.